Companion is perfect for any budget and seating d_cor, providing durability and long-lasting comfort. Companion is perfect for any budget and seating d_cor, providing durability and long-lasting comfort. 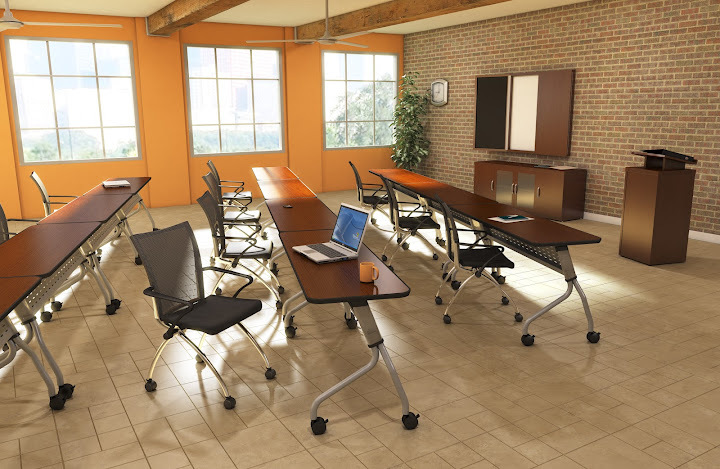 Style and personality define the Lynx collection of versatile seating solutions for training, conference, break rooms and educational settings. Available as guest/ side chair and counter height stool. Style and personality define the Lynx collection of versatile seating solutions for training, conference, break rooms and educational settings. Available as guest/ side chair and counter height stool. Highmark Quickstacker blends form with function for a slim, attractive profile. Highmark Quickstacker blends form with function for a slim, attractive profile. Highmark Quickstacker blends form with function for a slim, attractive profile. The Event Series Chair Cart transports and store chairs, and is easy to assemble. It is able to ship via small parcel. It can hold a maximum of 60 chairs. The Event Series Heavy Duty Folding Chair has a contoured, durable polyethylene seat and back. It has an integrated back handle for easy set-up, and arched cross-braces on the legs for exceptional strength. It is able to ship via small parcel. There is an Optional Cart available. The chairs ship four per carton. The Event Series Folding Chair has a Polypropylene seat and back that provides durability. There is a double-riveted cross brace on the rear legs for stabilization. The frames are powder-coated. It is able to ship via small parcel. The 2200 Series cart is available, model 2200C. There are 8 chairs shipped per carton. The Event Series Chair Cart transports and store chairs, and is easy to assemble. It is able to ship via small parcel. It can hold a maximum of 27 chairs. The Event Series Steel Folding Chair has a contoured seat and back for maximum comfort. The frame is constructed of 18-gauge tubular steel. It has Double-riveted cross braces on the front and back legs, with a powder-coat finish. It is able to ship via small parcel. The chairs ship four per carton. The Event Series Steel Folding Chair has a contoured seat and back for maximum comfort. The frame is constructed of 18-gauge tubular steel. It has Double-riveted cross braces on the front legs, with a powder-coat finish. It is able to ship via small parcel. The chairs ship four per carton. The Event Series Ventilated Back Folding Chair has a Polypropylene seat and back that provides durability. There is a double-riveted cross brace on the rear legs for stabilization. The frames are powder-coated. It is able to ship via small parcel. There are 8 chairs shipped per carton. 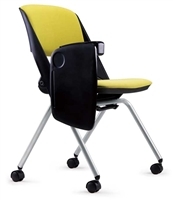 The Event Series Stacking Chair has a one piece polypropylene seat. It does not ship via small parcel. An Optional Cart is available. The chairs ship four per carton. Thesis Training Stools perfect for standing-height desks, drafting tables, and much more. Thesis Training Stacking and Nesting Chairs perfect for meetings, training, conference, classroom and much more. Thesis Training Stacking and Nesting Chairs perfect for meetings, training, conference, classroom and much more. The Valore Series Mid-Back Chair has a comfortable mesh back with a black fabric cushion. It is compact with nesting storage. It has standard arms and dual-hooded casters. The chair frames have a standard powder-coated silver finish. It is CA117 approved. It is shipped assembled, 2 per box. The arm height is 26". It has a 250 lb. Rating. The seat height is 18 1/2". The Valore Training Series Height Adjustable Task Chairs have an arm height that is 24 1/4" (at lowest setting). It is shipped 1 per box. It has a 5-Star, 27" aluminum base. It is CA117 & CA133 approved. It has a 250 lb. rating. The Seat Height is 18 1/2" at its lowest point and 22" at its highest. The Valor Training Series High Back Chair has a 250 lbs. rating. It has a comfortable mesh and fabric combo with a synchro-tilt movement. The seats flip allowing for compact, nesting storage. It is CA117 approved. It has chrome legs, and dual-hooded casters. Shipped Assembled, 2 per box. The Seat Height is 18 1/2" The Valor Training Series High Back Chair has integrated arms that are 25" high. It has a 250 lbs. rating. It has a comfortable mesh and fabric combo with a synchro-tilt movement. The seats flip allowing for compact, nesting storage. It is CA117 approved. It has chrome legs, and dual-hooded casters. Shipped Assembled, 2 per box. 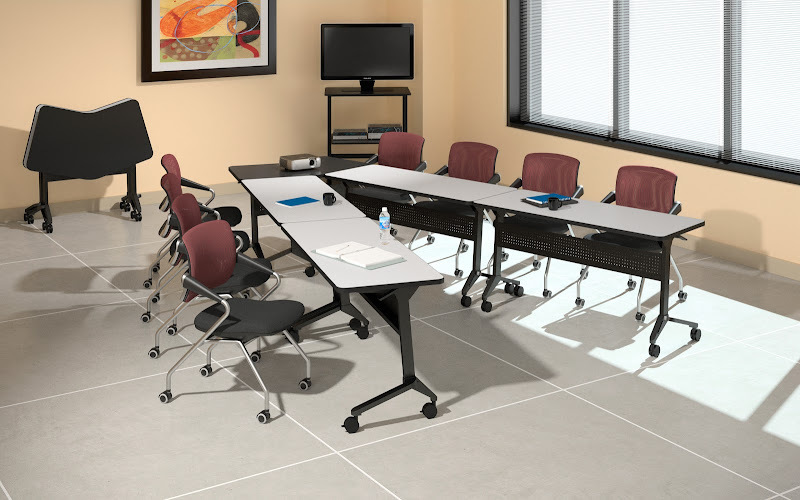 The Seat Height is 18 1/2"
These Mayline training and classroom chairs bring style, durability, and utility to your office environment, training rooms and common areas. MiEN OAR Nesting Tablet Chairs are perfect for dynamic training rooms, classrooms and much more. The OFM ReadLink features modern styling and easy installation for your auditorium seating. The OFM group seating combines clean, modern lines with stylish accents and a wide selection of furniture accessories. The OFM Stacking Chairs feature modern styling for your lunchroom or break room. The OFM cafe furniture combines clean, modern lines with stylish accents and a wide selection of tables, and chairs. The OFM Stacking Chairs feature modern styling for your lunchroom or break room. The OFM cafe furniture combines clean, modern lines with stylish accents and a wide selection of tables, and chairs. The OFM Cafe Stools and Chairs feature modern styling for your lunchroom or break room. The OFM cafe furniture combines clean, modern lines with stylish accents and a wide selection of tables, and chairs.